A British-led team is amassing evidence that indicates Kefalonia's western peninsula, Paliki, was only recently joined to the main landmass. The team believes a huge in-fall of rock in the last 3,000 years may have built a land-bridge between the two. If correct, the researchers say, it would support their view that Paliki was the real site for Homer's Ithaca. The location was supposedly home to Odysseus, whose mythical 10-year journey back from the Trojan War was chronicled in the Greek poet's epic tale The Odyssey. New results from a test borehole and other survey work in the region lend support to the Paliki hypothesis, the team claims. "Unlike many historical speculations, our answer to the age-old mystery of Ithaca's location makes a specific prediction that can be scientifically tested by geological techniques," said Robert Bittlestone, the businessman who first made the contention in a book published in 2005. Most people think modern-day Ithaki on the eastern side of the Ionian island group is the proper geographical setting for Ithaca; but the research team, which includes geologists, classicists and archaeologists, begs to differ. It argues the Ithaki interpretation is inconsistent with Homer's own descriptions of a low-lying terrain to the west of all land. Mr Bittlestone and colleagues - James Diggle, Professor of Greek and Latin at Cambridge University and John Underhill, Professor of Geology at Edinburgh University - have sought to test whether Paliki's position furthest from Greece is a plausible explanation. They propose that recent, huge earthquakes triggered catastrophic landslides and rockfalls, and this material has covered over a narrow marine channel which separated the peninsula from Kefalonia during the Bronze Age. Professor Underhill was initially highly sceptical of this idea, because it requires huge volumes of rock to have come off the hills that flank what is now the Thinia isthmus. But the latest results obtained from a 122m (400ft) borehole drilled in October at the southern end of the land connection lend support to the hypothesis. It found only loose aggregations of rock as it cut down to - and beyond - current sea level. "Crucially, we didn't hit limestone bedrock, which means that the theory still holds," explains Professor Underhill. "The second key thing is we have found that the landslide and rockfall debris of the right type extends to at least 40m below the surface, and, vitally, scanning electron microscopy undertaken at the Academy of Sciences in Sofia shows that it contains Holocene microfossils - it's in the right timeframe," he told BBC News. And other evidence points the same way, Professor Underhill says. Would Homer's stories have had real geographical backdrops? 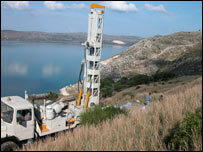 A marine seismic survey shot jointly with the Greek Institute of Geology and Mineral Exploration (IGME) immediately offshore from the southern Thinia area indicates that the underlying bedrock does have a valley shape in the neighbouring gulf, and its contours fit one-for-one with the presumed course of the marine channel suggested by the onshore geology. Ancient roads interrupted by landslides and major rockfall deposits are also still visible on the surface. "We now want to shoot a land-based seismic survey to get a 3D image of the subsurface along the whole extent of the valley onshore, and on the basis of that drill further boreholes where the theory is most challenged - i.e. where the topography of the valley is at its highest level, in the saddle," said Professor Underhill. 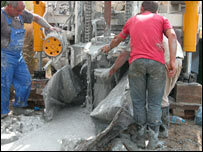 Applications for funding will be made to UK and Greek authorities. The Odyssey seems to have been composed in about the 8th Century BC. Its descriptions of Gods and giants are clearly fanciful, but the poem has had a huge influence on Western culture, and the team says it is perfectly reasonable to suppose the story had a real geographical setting. The city of Troy featured in Homer's other epic, The Iliad, is now widely recognised to have been in north-western Turkey. 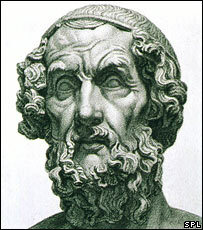 A study of river sediments in the region would even seem to fit with aspects of the military campaign that Homer's story says eventually led to the destruction of the city. "Until about the 1850s and 60s, when [the German archaeologist Heinrich] Schliemann discovered Troy, people thought that the Iliad was a work of fiction. Now, they're not so sure because it describes a real landscape; it's been excavated," said Mr Bittlestone. "If it is the case that The Odyssey and the return home to Ithaca also described a real landscape, this is of monumental significance for our understanding of where our culture's come from and what its routes really have been," he told Channel 4 News. Commentators say that if the Paliki theory is eventually proven, it is likely to initiate renewed archaeological interest in the peninsula, which has long and perhaps unfairly been considered a backwater. Towards dusk; the rest, apart, face dawn and sun.